Have you ever wondered if it's safe to give to your dogs rawhide? Dogs certainly love them, but vets and pet owners alike seem divided about whether these chew treats are really a good choice for pets. According to Web MD for dogs, rawhide and beef hide chews can present a choking hazard if they're not used under supervision. As your dog chews and slobbers on his treat, the hide becomes rehydrated, soft and gooey. When it reaches this point, your dog is able to tear away sections from the main bone. Most of the time your pet will simply wind up eating the hide and it will pass through his digestive system without a major event. The hide can actually become lodged in a dog's teeth and require an owner's assistance to remove it. Large chunks may be too big to swallow and cause a dog to choke; you may need to then save the choking dog. Intestinal blockage can also occur if the chunk of hide becomes lodged somewhere along the intestinal tract, and surgery may be required to remove it. While all of these scenarios are possible, they actually happen quite rarely. Web MD further advises that these chews can contain trace amounts of toxins, as well as E.coli or Salmonella bacteria. This can be harmful to the pets that chew them, as well as the people that handle the chews. People with immune deficiencies should be especially careful to wash their hands after handling a chew. 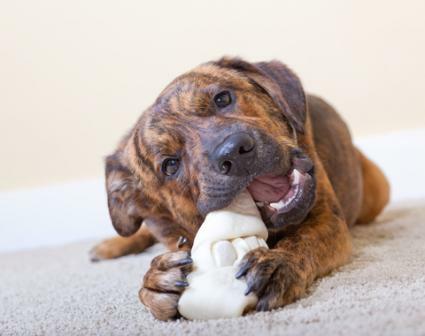 Rawhide chews do provide some benefits for your dog. As your pet chews, the hide scrapes away tartar and calculus where harmful bacteria like to hide. This reduces your dog's chance of developing gum disease and tooth loss. Raw hides also give your pet a chance to exercise his natural chewing instincts on an appropriate item versus your table leg or favorite pair of loafers. Chewing can be a great stress reliever, so it's important to supply your dog with safe chew toys and bones. If you decide to let your dog have a rawhide chew, there are a few precautions you should take to ensure your pet's safety while he enjoys his treat. Try to select granulated rawhide chews whenever possible. These usually pose the least choking hazard. Make sure the chew is large enough that your dog can't fit it completely into his mouth. Only give your dog a beef hide chew when you can be around to keep an eye on him. Keep two chews on hand and trade them when one becomes too soft. The hide will harden as it dries, and you can give it to your dog again when the other chew becomes soft. If the chew becomes excessively dirty, just throw it away. Replace your dog's chew when he has whittled it down far enough to fit in his mouth. While you're weighing the benefits of rawhide against the hazards, don't hesitate to consult your vet for a professional opinion. Your vet may be able to share some first hand experience about the potential problems these chews can cause, and just how likely it is that they could become hazardous to your own pet. As with all things, moderation is also important. 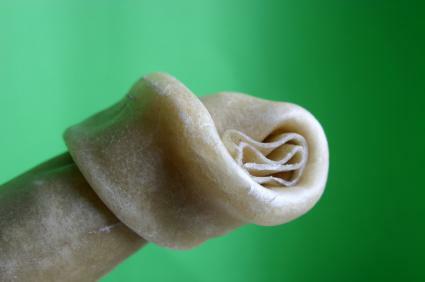 Offering your dog an occasional piece of rawhide is probably fine, but don't make these chews a steady diet.